Creating an activity in Messenger Payments is very straightforward and can be completed in just a few minutes. This guide will help walk you through each step of the process. 1) From your Tiles (Homepage) in Messenger, click on Create Activity from the Messenger Payments Tile. 2) Alternatively, if you are already in Messenger Payments, click from your View Activities Dashboard. Enter the required details (fields with an *asterisk) for the new activity: Activity name, Start & Finish Time, Cost, and Ledger Codes. Mandatory sections of this panel are outlined below. Enter the amount that parents need to pay for this activity in the format: #.##g. 15.00. You can choose to add the usage charge to the total amount each parent will need to pay for this activity. 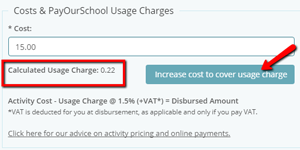 This is automatically calculated and can be added to the cost by clicking Increase cost to cover usage charge. For more information on the usage charge, click here. Is Consent Required for this Activity? Toggle to Yes if parental consent is required for this activity. Doing so will mean that parents must provide consent for the trip or activity, before paying for the activity. Just toggle Discount applied? to Yes, and enter the amount any additional child will need to pay (format: #.##g. 10.50). Once you have entered the required information, click from the bottom of the panel. From the Add Recipients panel, you will need to select the students you wish to add to this activity. 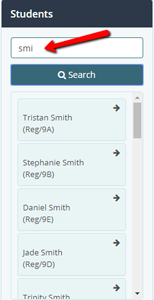 You can either use the Class & Groups panel, or the Students panel to search for recipients. Class data is synced from Messenger. 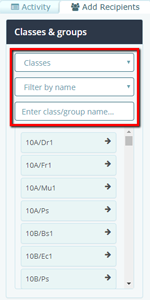 1) From the first dropdown, choose whether you wish to find classes or groups (e.g. FSM, House, Reg, Messenger Saved Groups). 2) To narrow down the list of groups, you can start typing a class/group name in the third box to narrow down the results. 3) Click on the small arrow next to the class or group you wish to add. 1)Type in at least the first three letters of the student’s surname that you would like to add, then click Search. 2) Click on the small arrow next to the student you wish to add. 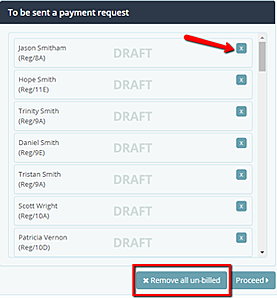 From the Draft Payments panel, you will have the opportunity to view and edit individual students’ payments if required. Alternatively, if you would like to apply a new amount to all recipients, click Apply Discounts from the top of the list. Changing the amount in bulk will remove any discounts applied to siblings. 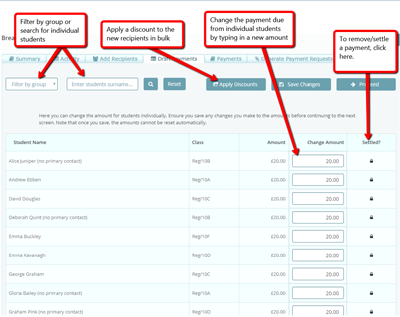 1) To remove the requirement to pay for an individual student completely, click on the icon in the Settled? 2) Don’t forget to first click Save Changes from the top of the panel to ensure changes are updated. 3) Click Proceed once you are ready to issue payments. If you need to double check any of the details for this activity before you send payment requests to parents, you can do so by click on the relevant tab from the top of the panel. 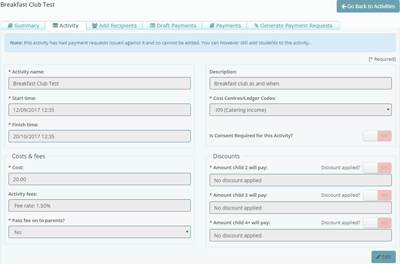 From the final step, you can choose to attach files to the payment request that is sent to parents, e.g. informational leaflet for a school trip. Please note, any attached files will be sent to all parents, and as such must not include any personal information – just like any normal attachment in Messenger. Once you are ready to send payment requests, click . Ensure you only click this once - depending on the number of recipients, this may take a few additional seconds to update. 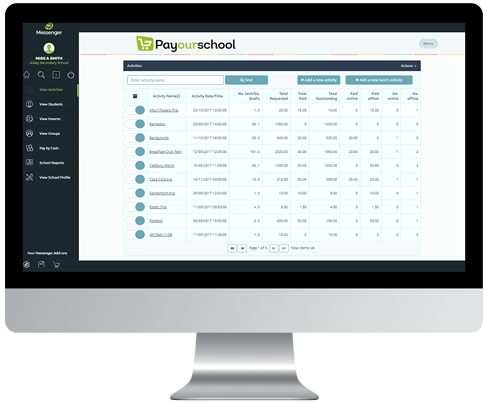 Top Tip: Once you have created an activity, you can keep an eye on parental payments from your View Activities Dashboard. You will also be able to make a number of changes to an activity after you have created it. To find out more, click here.